Memory loss can be one of the most terrifying aspects of a diagnosis of dementia. Yet the fear and dread of losing our memory make the experience of the disease worse than it needs to be, according to cultural critic and playwright Anne Davis Basting. She says, Forget memory. Basting emphasizes the importance of activities that focus on the present to improve the lives of persons with Alzheimer’s disease and other dementias. Based on ten years of practice and research in the field, Basting’s study includes specific examples of innovative programs that stimulate growth, humor, and emotional connection; translates into accessible language a wide range of provocative academic works on memory; and addresses how advances in medical research and clinical practice are already pushing radical changes in care for persons with dementia. Bold, optimistic, and innovative, Basting’s cultural critique of dementia care offers a vision for how we can change the way we think about and care for people with memory loss. 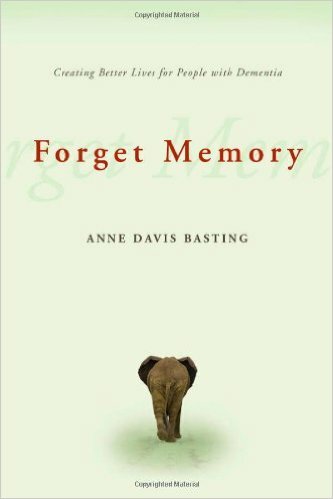 Forget Memory is a book about memory loss by Anne Davis Basting. Her goal is to create better lives for people with dementia. Signup for our monthly dementia focused resource newsletter.